Multinational apparel company Adidas has turned itself into a global branding juggernaut whilst simultaneously avoiding any public scrutiny over the working conditions of its factory workers. Ashok Kumar explores the development of the global anti-sweatshop movement and shows how two decades of activism have culminated in a new multi-nation campaign against the company. This article originally appeared in Ceasefire Magazine. Unlike the perceived ambiguity of much of the anti-capitalist movement at the time, the anti-sweatshop movement has always remained steadfast in its demands. Issues such as dignity at work, freedom of association and livable wages remained at the forefront. The problem wasn’t that workers and activists didn’t know what they were for – it was how to get it. One of the more pressing issues of subcontracted labour is the non-payment of a legally mandated terminal compensation (‘severance’). In 2011, the PT Kizone factory in Indonesia was forced to close and 2,700 workers were left immediately without jobs. The factory produced for Nike, Adidas and the Dallas Cowboys. As indicated in a report by the Workers Rights Consortium (WRC), Nike and the Cowboys immediately agreed to pay their share of what was owed, £1m and £33k respectively. However, Adidas, which owes £1.2m, continues to refuse, claiming ‘no business relationship at the time of closure’, a fact that the WRC report states is “without any basis”, since Adidas continued orders a full two months after the violations began. Adidas recently offered a £20 food voucher to Alfamart, the retail price of an Adidas football, as a substitute for what is owed. The workers flatly rejected the offer. Adidas’ position is consistent with their well-documented record on workers’ rights abuse. The company was formed in the shadow of Hitler’s Third Reich. Founder Adolph “Adi” Dassler, an active member of the Nazi party, transformed his shoe factory into a small arms factory during WWII. In the decades since, the Adidas Group has risen to become one of the largest and most profitable brands in the world. It towers above any other Olympic sponsor, enjoying a ‘big lead’ in public perception according to the YouGov 2012 BranIndex, and has successfully implanted itself into every section of the market and every genre of social and cultural life in a way unmatched by any other brand. Adidas’ profits have climbed dramatically and it is now seen as a ‘recession-proof’ brand. In 2005, the company acquired its rival, Reebok, as part of an aggressive new strategy to dominate the global sportswear apparel market. Adidas has witnessed an 18% spike in sales in the past twelve months alone, bringing its annual revenues to $13.3 billion in 2011 (£8.6b) and is expected to gain an additional 12-17% in 2012. These profits come aloft an aggressive marketing strategy to carve out a major share in every major sporting event, from an 11-year $400m (£260m) deal as official clothing provider for the NBA to its $100m (£65m) sponsorship of the 2012 Olympics, Adidas’ profits are expected only to rise. Despite this success, Adidas remains an industry leader in violations to its more than 1 million workers, labouring away in 1,236 supplier factories in 63 countries. Adidas retains a ‘zero tolerance’ policy towards workers organising or trade union activity in any of its subcontracted factories. Indonesia remains a major supplier country, where Adidas full time workers bring home less than $2 (£1.3) a day, and some of whom have reported how, “everyday someone in the factory passes out because of exhaustion.” In 2005, dozens of union leaders at Indonesia’s PT Panarub factory were dismissed and blacklisted for participating in a legal strike. The factory is one of the world’s largest suppliers of footwear and cleats for Adidas. By 2006, Adidas had reduced its orders to the factory leading to 1,000 lay-offs. 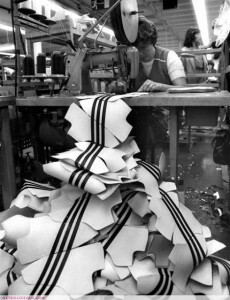 Around the same time, El Salvador’s Hermosa factory was forced to close down after workers formed a union and Adidas abruptly halted its orders to the factory. 260 workers were laid off with £535,000 unpaid severance. To this day many of the workers continue to be blacklisted from employment. In 2006, less than a year after Adidas purchased Reebok, two Reebok producing factories in Indonesia, PT Spotec and PT Dong Joe, closed down. As is standard operating procedure for Adidas producing factories – union leaders were blacklisted, and 10,500 workers were laid-off. A 2010 report found that 9,000 of those workers remained unemployed despite Adidas’ ‘commitment to rehiring’. It was reported by the Indonesian Footwear Association that Adidas/Reebok had not increased payments to the suppliers for over 5 years preceding the closure, whilst at the same time Adidas executives could be found boasting of a 27% second quarter net profit as a result of the Reebok takeover. Between the 24th and 29th of June 2011, 93,000 workers at a major Adidas supplying factory, Pou Yen in Vietnam, took strike action for better pay and conditions. Over twenty workers were arrested and three young labour activists were sentenced to prison for nearly a decade for their involvement in organising the strike. Just this week the Daily Mail reported that the London Organizing Committee would be investigating Adidas after revelations emerged that ‘workers living in cramped squalid conditions said they earned $61 (£40) a month for working eight hours a day, six days a week’ to produce Olympic ‘fanwear’. Unlike other cases, the recent case of PT Kizone has resulted in an eruption of protests in Indonesia and in the global North. The tactics and strategies of global corporate campaigns employed today are the result of lessons learnt from two decades of anti-sweatshop campaigning. ESPN’s “Outside the Lines” reports on Dallas Cowboys apparel sweatshops exposed by organizing efforts. During the industrial era, it was the regulation and effective control of most stocks and flows, particularly over commodities, money and capital across well-delimited territories that resulted in higher negotiating power for workers without risk of capital flight. From the mid-1970s onwards, however, the global North underwent a ‘post-industrial revolution’ resulting in a closing of much of the manufacturing industry and with it an end to historic industrial union power. This manufacturing shifted to subcontracted factories in the global South, where worker resistance has been met with an end to product orders and the closing of the factory, rendering industrial trade unions powerless against liquid capital. Neoliberal globalisation has radically empowered transnational corporations ( TNCs), injecting capital into landscapes that were once insulated from global capitalism. The garment sector, described as ‘the most globalized industry in the world’, has shifted from “production-driven” to “buyer-driven” commodity chains, meaning the geo-economy is now determined by brand-name merchandisers (read: buyers) who, through their ability to select suppliers from all around the world, concentrate enormous profits and power from those who produce the commodity to the brands who purchase them. By exploiting geographic differentiation in costs, surplus labour, and the restructuring of state regulation, TNCs have been able to turn the screws tighter and tighter on complex supply chains. Activists’ initial reactions to capital flight saw calls for protectionism from the increasingly ossified trade union movements of the North who tended to blame so-called “cheap” workers in the South with little effort to develop solidarity between the two spheres. The 1990s, however, witnessed a further expansion of global capital and with it an eruption of anti-sweatshop solidarity campaigns specifically targeting major clothing brands. These campaigns proliferated as stories of cramped factory conditions and the overworked and underpaid female garment workers of the South began trickling up to the North. The early 2000s saw a wave of animated grassroots anti-capitalist protest on the heels of the historic convergence of ‘teamster and turtle’ against the WTO in Seattle. A consensus amongst trade union activists began to take shape in both spheres of the globe. In the heady days of the 1990s, students and activists demanded that companies adopt “codes of conduct”, TNCs responded to the flurry of anti-sweatshop activity in the global North by introducing codes. The code of conduct model within a consumer choice regime continues to remain the strategy of many first-world ‘anti-sweatshop’ or ‘fair trade’ NGOs. The voluntary nature of codes along with market-based ‘fair trade’ certification make enforceability near impossible, entrenching a colonial north-as-agent and south-as-victim power dynamic, and serving only as a convenient public relations tool for TNCs. After the failure of a consumer choice-centred strategy, some NGOs shifted gears, lobbying to provide resources to state governments to enable them to enforce their own labour laws. Pushing for the regulatory power of nation-states to combat the hegemony of capital. This too, by all available accounts, has proven a failure. The primary reason is linked to the relationship between global capital and the state. Global capitalism has weakened states to the extent that many consciously undermine their own laws to create the optimum environment for capital accumulation. Thus with the acceptance of increasing nation-state powerlessness and its position within global capitalist formation, activists proposed reverting the meta-national governance regimes (free trade and WTO agreements), that have accelerated the capacity of capital to globalise, to include a minimal standard of workers to organise and bargain collectively. The demand for workers’ rights from capital’s supranational edifices, such as NAFTA, GATT and WTO as arbiters (commonly referred to as the ‘social clause debate’) has, with the exception of Europe’s Maastricht Treaty, few documented cases of any real application. Other international bodies, such as the UNs International Labour Organization (ILO) have honourable goals, but again, have few examples of enforceability at the base. On the issue of these conflicting “rights”, Marx famously wrote that “between two rights” – that of owners to appropriate common goods; and those of the dispossessed – “force decides”. This extends to the neoliberal context, as the rights of the dominant social process of capital accumulation through market exchange against the rights of workers for political democracy and collective action. The anti-sweatshop models outlined thus far have done little to open up space for workers to organise. Especially in the most exploitative industries, like the garment sector, where there are almost no examples of large-scale factory unionisations that have not resulted in the ‘cutting and running’ of capital, invariably leading to the closure of the subcontracted factory. Methods that rely solely on the benevolence of consumers, NGOs, the State or the perceived benevolence of transnational capital prioritise the rights of capital over that of labour. Peter Dickens sees global commodities as “derived more and more from an increasingly complex geography of production, distribution and consumption.” In other words, the point of consumption in the new international division of labour is a critical component to combat the asymmetrical relationship between capital and labour. By the late 2000s, activists from both global spheres recognised the need for worker-driven campaigns that harnessed both worker and consumer power. Many of the corporate codes of conduct that had originally been pursued by activists were now being followed-up by consumer-driven corporate campaigns as a means of enforcement. Modern labour corporate campaigns claim their roots in the United Farm Workers (UFW) of the 1960s and 70s that incorporated a worker-driven strategy of strikes in the field and secondary pickets of purchasing retailers. Targeting more than 200 different agribusiness item, the UFW was most notable for its highly visible strikes and boycotts, as well as securing victories against major grape growing corporations. This strategy finally led to the 2008 SITRAJERZEESH Union and United Students Against Sweatshops (USAS)-initiated campaign against Fruit of the Loom subsidiary Russell Athletic. It serves as an instructive model of successful transnational solidarity given the historically insurmountable challenge of trade union organisation under the regime of global capital. 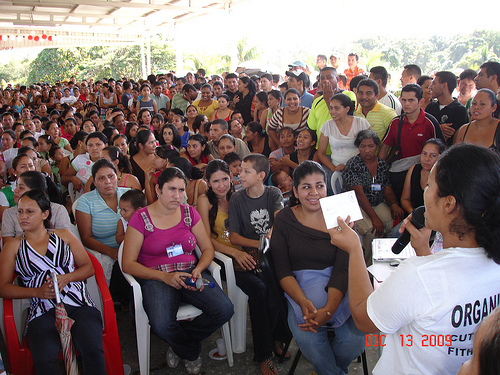 Through a two-pronged latitudinal strategy, workers in Honduras attacked the source of capitalist production whilst activists in the core responded through a comprehensive coordinated retail boycott, targeting at the consumer, retail, licensing and political levels in the US, Canada and the UK. The campaign led to 110 universities cutting contracts valued at over £33 million, becoming the largest collegiate boycott of an apparel brand in history and leading to an unprecedented reopening of a unionised garment factory, rehiring of over 1,200 employees, a multi-million dollar payout to workers and a commitment from Fruit of the Loom to extend union neutrality across its supply chain in Honduras. With eight factories and 10,000 workers, Fruit of the Loom is the largest private sector employer in Honduras – making the agreement far-reaching. The campaign’s landmark success is a result of its incorporating a worker-led, solidarity-based strategy rather than the established model of consumer-led campaigns. This brings us back to Adidas, which has established itself as a global juggernaut of corporate power and influence. With its well-oiled PR machine, glossy annual CSR report, army of spin-masters justifying abuses under a guise of the ‘complexity of wage-setting’, with board seats in Kafkaesque front groups like the ‘Fair Labor Organization’, alongside insidious campaigns like ‘Girls all in’, and a history of claims of ‘rehiring’ fired workers (which has never materialised anywhere) Adidas has successfully ducked and dodged every attempt at accountability – ensuring the continued systematic abuse, humiliation and violent extraction from its sweated labour in the far corners of the globe. Its messaging is crisp: winter or summer, young or old, fat, skinny or athletic – Adidas is everywhere and is for everyone. Whereas main competitor Nike is limited to athletic activity, Adidas has reached ubiquity. Walk down an East London street and you will find thick-framed hipsters sporting the pastiche flavors of Adidas Originals, take a stroll down a housing estate and it becomes clear that the Adidas bag is a staple accessory for many working class youth, go to a swanky gym and you’ll find middle-aged yuppies sweating it out in a class or in the weight room in Adidas sports apparel. Switch on the TV – from musicians to athletes to cultural icons, from Katy Perry to Andy Murray to Missy Elliot; Adidas has come to define a kind of universal cool, a brand identity with few race, class or gender boundaries to box-it-in or out. Adidas’ documentary-style, pulsating adverts allow it to traverse the full breadth of the public’s purchasing power, dialectically exploiting whilst also transcending the constructions of difference, reproducing otherwise fragmented social relations to expand its market share. This strategy fits snugly into the cultural logic of late capitalism where real life is inseparable from advertisements and ‘identity’ is presented as fluid and transient, with its relevance underpinned only by niche consumption practices. Established notions of community are degraded and people are forced to seek identity exclusively through the products they purchase. They not only tell you what to think (‘I need those sneakers’) but how to feel. The commodity dominates; ones perceived ‘free choice’ has largely already been made for them. Adidas, alongside other brands, facilitate communities of utilisation and compulsion within a culture that engenders the individual seemingly devoid of the collective. Thus, successfully confronting it from below through collective action is no simple task. The case of PT Kizone has resulted in demonstrations by hundreds of workers and their families at the German Embassy in Jakarta, quickly escalating into a full-fledged USAS campaign and solidarity demonstrations in Spain, Denmark, Germany, Austria, with contracts threatened on campuses in the US. 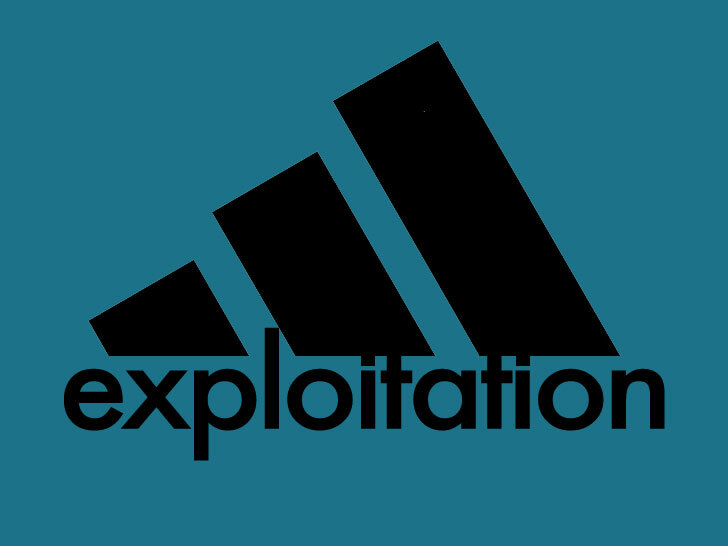 Here in the UK, groups War On Want, People and Planet, and Labour Behind the Label announced they will campaign to ensure Adidas pays what it owes to the workers of PT Kizone. Today, workers and activists have the historical space to reflect, reassess and realise that the ends remain the same – the means, however, different. That it is ultimately through the collective struggle by labour-led organization at the point of production, coupled with international solidarity at the point of consumption, that workers and the oppressed can cripple the force of transnational capital. Ashok Kumar is a writer, activist and a PhD candidate of Economic Geography at Oxford University. He was a contributor to The Assault on Universities: A Manifesto for Resistance (Pluto 2011) and It Started in Wisconsin: Dispatches from the Front Lines of the New Labor Protest (Verso 2012). He tweets at @kumar__ashok. The introductory paragraph mistakenly uses the term, multinational, even though the author is clear that these global corporations are transnational. Multinational corporations are national companies with foreign subsidiaries, while transnational corporations (TNCs) do not identify themselves with one national home. They have headquarters in three or more countries. This is a very important distinction, because the capitalist classes that arise from such deterritorialized corporations also do not identify themselves with any one national home. They are merely local fractions of a transnational capitalist class–one that is externally-oriented. This is the class that created and controls the supranational bodies such as the World Bank, the IMF, the OECD, the WTO, UNCTAD and dozens more. Ashok Kumar makes a really good analysis of the challenges facing production workers in the global capitalist system, where consumers are far removed from the point of production. In fact, with highly diversified production chains, the various components of one item can be produced and assembled in several different countries. He also points out how transnational capital, through local fractions of the transnational capitalist class, has systematically colonized and restructured states. Neoliberal governments are nothing but managers, facilitating accumulation by TNCs. The best solution would be for the working classes in each country to take control of their governments by defeating political parties that represent the TNCs and defend neoliberalism. They need to renationalize privatized resources, services and industries and carry out land reform. Sovereignty must be reclaimed–not for a new national capitalist class, but for the working classes. I received the following notice via the Clean Clothes Campaign. You might want to sign this petition as well.